The sights I saw were simply awesome. As Timur said to me, Samarkand was then and still is, the centre of the centre of Central Asia. What really struck me after 8 hours of non-stop walking, was the fascinating balance of scale versus detail. 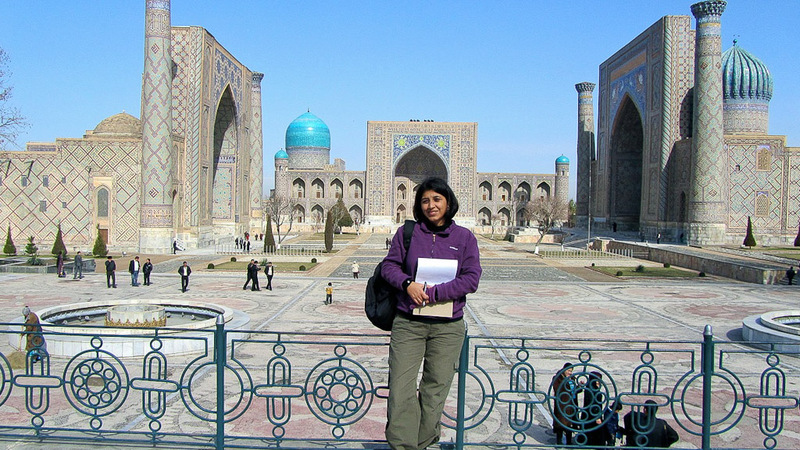 Take Gur-e-Amir, Timur’s stunning mausoleum. 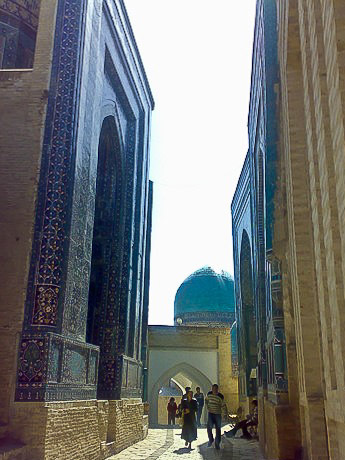 It has the most majestic dome in Central Asia but his actual jade tombstone is comparatively simple, a little bigger than perhaps the man himself. The pillars of the dome are inscribed with dramatic, large kufic calligraphy, not for the sake of scale alone but to enable the viewer who stands small, almost 60 ft below, to read and admire its meaning and beauty with perfect clarity. 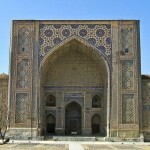 I noticed the same thing in Registan’s madrasah (an Islamic theological school) – the building itself is magnificent but the entrance to it is not from the centre (as you would expect) but from two sides through doors that are as wide as your shoulder and so low you need to bend to get through. Why? The house of knowledge is great but its students, humbled. It’s not bending through the doorway but bowing to the person receiving you inside, who is most probably the mullah or teacher. Incidentally, the place where you would expect the big entrance doorway to be is instead an exquisite lattice-work façade that let’s you see the outside from the central courtyard within. I am told, this constant view represented a metaphorical choice for each student. Were they prepared to remain within the place of learning or be lured by another world outside. 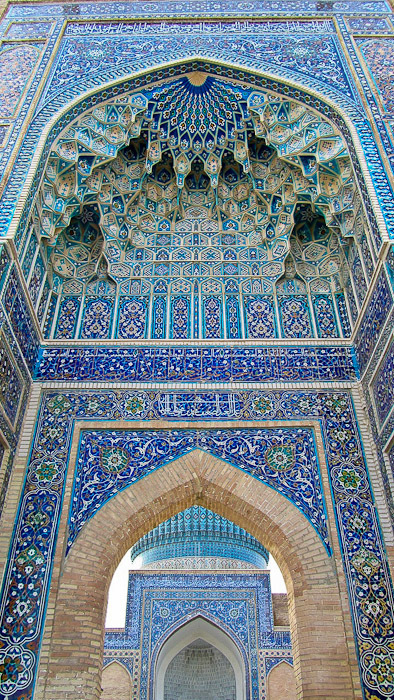 The sweeping architecture of Samarkand is so dazzling and thought-provoking that it warrants some moments of respite to simply soak it in. 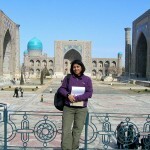 I haven’t even discussed the Bibi Khanum Mosque or Shah-i- Zinda, the Necropolis of the Living Kings. 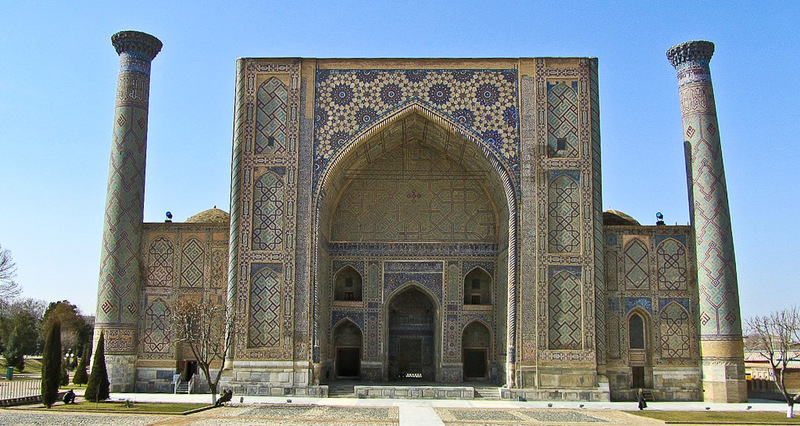 I haven’t shared with you how Timur forcibly relocated artisans from the far reaches of his lands to build Samarkand’s architectural wonders with fascinating influences from across the region. 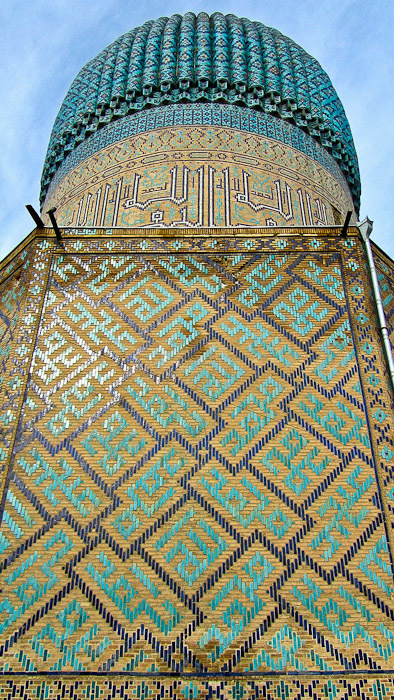 Of particular interest to me is the work of the Persian slave artisans who are believed to have incorporated ancient Zoroastrian symbols into their tile work. I have come across one recurring symbol in brick and tile work which I don’t recognize from my, albeit limited, knowledge of Zoroastrian as it is practiced in India: it’s a twin inverted triangle or as Timur called it, the Zoroastrian butterfly. But that’s getting into a whole different discussion… maybe tomorrow. 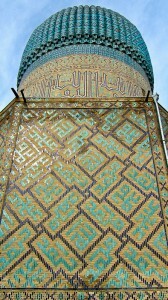 This entry was posted in Uzbekistan and tagged bibi khanum mosque, gur-e-amir, kufic calligraphy, registan's madrasah, samarkand, shah-i-zinda, timur, timurid, zorastrian butterfly. Bookmark the permalink. Both comments and trackbacks are currently closed. I got your blog details from Jenny. 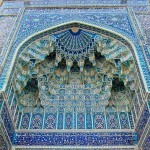 We are planning a trip in June first week to Uzbekistan. i have read bits of your blog really enjoying it. thank you for such interesting details and sharing everyday joys of travelling. any tips on clothing for June..?